Apparently there was no organized fire department in the Oregon territory just south of College Place. People don’t consider the need for these sort of niceties until their house is actually on fire. After hearing reports of smoke, some of the locals from Walla Walla County Fire District 4 started looking for the fire. In rural communities, postal addresses are seldom used. Landmarks and dirt roads are the usual method of navigation. So it was no surprise that no one really knew where this fire was located. As we listened to the radio chatter, there was some confusion as to whether this burning house was in Oregon or Washington. If it was in Washington, the county fire guys would take care of it. If it was in Oregon, they would have to let it burn. Newcomers to rural living are often shocked to hear there is no organized and official fire suppression agency. Like tap-water, toilet paper, and electricity, they just assume this stuff is provided by some omniscient political body. Actually, modern, public fire agencies are fairly recent technological development. Benjamin Franklin is often credited as the inventor of the fire department (I have never fact-checked this, and today I’m on a roll and don’t want to get distracted by opening more tabs on my browser, if I’m wrong, let me know in the comments). For many years, fire suppression agencies were operated by the insurance companies who were seeking to minimize their losses. Eventually, as the 20th century matured, more government agencies formed their own fire departments. But there are many areas, especially rural communities, that still have no agency tasked with providing fire suppression, medical, or even police services. It was quite interesting to listen to the old-timers on the radio. There were references to the “old Miller farm” and that field that used to have a “couple of oak trees back in ’63.” By now we could see a column of smoke from our third-story dorm room. We hadn’t fought a good fire for several months and it was beginning to sound like this house-fire was just across the border in Oregon. Almost without words, we decided to grab our turnouts and head down to see if we could “help.” We grabbed the scanner and ran to Ray’s car – an early 70s, red, Ford Maverick. After stopping by the fire station to grab our gear, we headed south to find this unchecked house fire. Although we were driving into unknown geography, both of us have a keen sense of direction, and that, coupled with the confused voices on the radio – not to mention the large column of black smoke marking the location – we pretty much drove right to it. A column of black smoke indicates a “working” fire. A lot of carbon is being produced and the fire is freely burning. Columns of white, or gray, smoke indicate a more slowly burning fire. The column generally does not rise as quickly, and is often mixed with steam because of the water being applied by firefighters. Smoldering fires are filled with more toxic gases, carbon monoxide, and unburned materials. The column of smoke from this house rose hundreds of feet, straight into the air. It was black and we knew this house was burning pretty well. We weren’t quite ready for the scene that unfolded before us though. Long before seeing the flock of cars parked in front of the burning house, we saw a couple dozen people milling around the house, wringing their hands – literally, and figuratively. As we parked out front, we saw that this house was actually burning from the top down – like a cartoon. I’ve never seen a house burn like this ever again. The roof was fully involved and the flames were consuming the house from the top down. Several men were running in and out of the house, doing their best to salvage furniture, keepsakes, and appliances. Ray and I parked on the dirt road out front and just looked at each other with wide eyes. Now what? There was no sign of any fire apparatus – despite all the chatter we’d heard on the radio. This house was located in a rural Oregon county and no agency had authority to fight fires there. Again, without much discussion, we donned our gear and began to walk up the long driveway. We didn’t know what we were going to do, but we figured we were better trained and better prepared than anyone else there. We received a rock star welcome as the crowds parted to let us approach. Apparently they had more faith in us than we had hope in the situation. They applauded and cheered us as we strode to the fire – oblivious to their welcoming overture. By the time we arrived at the front door of this inferno, the flames had already consumed the roof and half of the walls. A couple of men had just removed the refrigerator from the house, but it was now unsafe for anyone to reenter the house – even with our protective gear. We stopped a man who was trying to get in. It was too hot to even be on the front steps. Now what? Ray and I were quite the team. We both had been involved in emergency services since our mid teens, we skied, hiked, climbed, and really enjoyed each other’s company. Just two years earlier, he was the first person I met when I transfered to a new school. Not only did he take the time to introduce himself and welcome me, but at lunch time, he invited me to sit with him and his friends. Now, as sophomores in college, all our energy was going into the local volunteer fire and ambulance organization. Besides upgrading equipment, procedures, and ticking off the old-timers, we loved to run calls. The ambulance was equipped with advance life support (paramedic-level) equipment, but we were only basic-life support (EMT-level) certified. That didn’t stop us – we charged ahead, using the heart-monitor/defibrillator, IV supplies, and medications. Our primary drug-of-choice was gasoline. We drove fast and aggressively. What were they thinking, turning over a 5000 pound 1964 Pontiac ambulance, with a Cadillac 454 under the hood, and three (count-em – three!) sirens – to a couple of teenagers!! We were insanely dangerous and hooked on adrenaline. Before the school year was over, both of us dropped all our classes, left a trail of debt, and took a bucket-load of memories. It is really hard to get up and go to classes when you’ve been up a couple of times in the night – saving lives and alleviating pain and suffering. Often, we’d get a routine medical transport, right in the middle of my extremely boring History of Western Civ class. No worries – I’m a rescuer! See you later prof! If the truth was known (though I’d never admit this), I got a real thrill acting like the “big-man-on-campus” – disobeying traffic laws, running out of the cafeteria, ditching classes, etc. It didn’t help my academics, or my social standing, but it was certainly fun! Again, without many words, we decided that trying to save the house was pointless. Even if we had five fire engines and an unlimited supply of water, the best we’d hope for was to save the foundation. However, right next to the house was a large garage/shed/out-building. Firefighting isn’t just about suppression, it is also about minimizing loss. If we can’t stop the fire, maybe we could keep it from spreading. Because of our turnout gear, we were able to put ourselves between the house and the garage. It was hot, but bearable. Unfortunately, there was no water. When the roof burned, it severed the electrical drop line to the house and the rest of the property – including the pump house. Now what? Someone figured out our plan and noticed the hundreds of Mason jars in the garage. 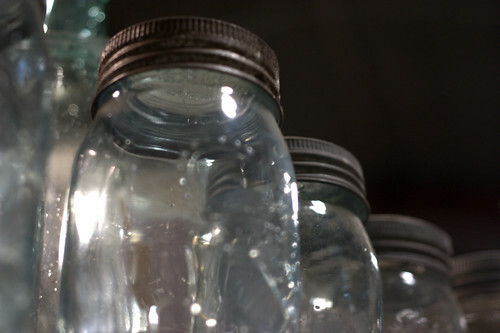 We organized a water brigade, not with buckets, but with quart jars. A long line of people formed, filling the jars in the horse trough and handing them down the line. We then splashed the water on the side of the garage to keep it cool and prevent the fire from spreading. It wasn’t much, but it was something. At least they’d have a place to store that salvaged furniture. As the fire continued to burn the wall of the house, just 10 feet from the garage, Ray and I took turns splashing water on the siding of the garage. It was these efforts that kept the garage from catching fire – which would have eventually spread to the other outbuildings nearby. It was in the midst of this surreal scene – two teenage boys, directing an eager team of rural farmers, to save what we could of these people’s property – when a 1946, Army-surplus, fire contraption showed up. It was red, very dusty, and had a hose real on it. Like keystone cops, these old farmers drove this rig right up on the front lawn, sliding to a stop – they jumped off, fired up the Briggs & Stratten pump and started spraying water on the now, nearly-incinerated house. Ray and I looked at each other in disbelief! We had already pushed the walls of the house into the fire to keep them from falling outward. The house was really not much more than a foundation filled with burning coals, and now these yahoos (yeah, I said it!) were dumping precious water onto a lost cause. Fortunately our helmets and firefighter gear gave us a level of positional authority. No one knew us, no one knew our names, and we didn’t know any of them. But we had absolute authority. 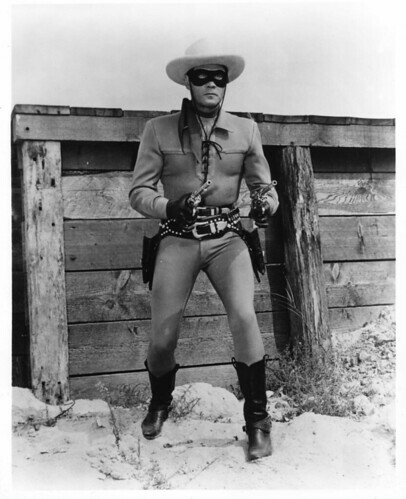 Much like Superman or the Lone Ranger must have experienced when they showed up to save the day. I asked, no, told the man spraying water on the ashes to give me the hose. Couldn’t he see what we were doing? Didn’t he see us struggling intensely to save this garage? Though the fire was nothing more than a heap of coals, it was still hot enough to ignite the garage if we didn’t keep it cool. What was he thinking!? As I took the hose, Ray got a pike pole off this old fire rig. With the pole he was able to move burning debris away from the house. (An interesting aside: Apparently this old fire rig was owned by the father of a paramedic I worked with years later at Buck Ambulance in Portland.) They kept this rig in case there was a grass fire that threatened their wheat of hay – but most of the time they used it to spray pesticides. This is the first – I learned one night several years later – and last fire they had ever fought with that rig. With the arrival of the fire apparatus, we disbanded the Mason jar brigade and used the hose to keep the garage siding cool enough to prevent ignition. 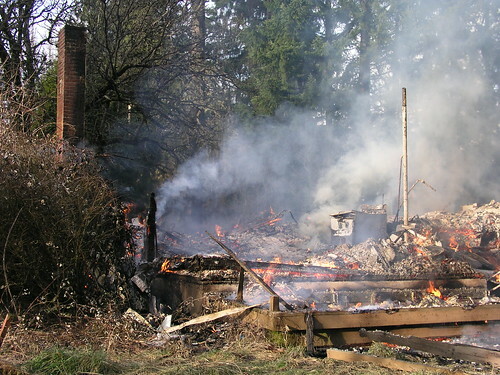 Within an hour of our arrival, the house had been reduced to smoldering pile of hot ashes. The once vertical column of black smoke had given way to a wispy, low-hanging cloud of white, choking puffs. The garage was no longer in danger of catching fire and the excitement was over. Ray and I walked back to his car, put our gear in his trunk, got in the car, and drove back to campus. About half way back to campus, we looked at each other. Wordlessly we asked: “What just happened! ?” And then we laughed all the way home! You are a great storyteller. I enjoyed it. Gary, has Ray read this yet? He should if he hasn’t. Nice story! Yea, Ray reads it on Facebook and commented there! Thanks!